I found this article on Promokitchen and thought I would share.. Some ideas we have talked about in previous posts, but worth a mention! The following article was written by Steve Pons, vice president – national sales, at Accolade Promotion Group (APG), a division of Golf Town Canada Inc. But what I find myself often struggling with is accurately identifying who the “right people” truly are. Even with employee screening and interesting sociological methods such as “The Offer” companies still say their number one challenge is finding and retaining the right people…the best people. I used to believe that the only indicator for someone being successful in any business was if they were well organized and if they displayed a confidence in themselves, what they were talking about, what their passion was, etc. 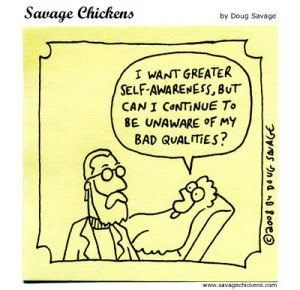 I’ve realized however that those are only the traits that appear when someone has a much more important quality: Self-Awareness. When reading stories about business success involving people such as Isadore Sharp, Tony Heish, Jeff Bezosand Warren Buffet, all of them in my mind have one consistent trait. They are very self-aware and adapt their business approach to not only their client audience but to those who work with them or for them. Over the years, I’ve seen a handful of people in the corporate merchandise services business (all of whom I would classify as successful) adapt their style to suit a variety of situations: C-level client conversations, asking team members to work extra hours to meet a deadline and negotiating win-win results with challenging clients or suppliers. In each circumstance the person was not only aware of who they were speaking with and what they were trying to achieve but also how to diffuse tension, instil confidence and make the other party feel comfortable that the salesperson was in control of the situation. As Matt Dixon speaks of in his book The Challenger Sale, customers respond to confidence and integrity. Salespeople that are confident in sharing what they know (and how that will bring real value to the client’s business) and have the integrity to admit where they are not experts often win over sales reps that unilaterally say “we can do anything!” A self-aware salesperson identifies their shortcomings and proactively seeks out ways to either learn what they feel they should know or to ask others to be a resource for them. They seek to become a greater expert to help teach their clients and provide real insights they may not have considered. Gone are the days that salespeople could use their greater knowledge of the products, supply chain, partnerships, etc. to demand a higher price. Clients can (and do) all their research often before the sales interaction starts. Virtually every sales rep has already seen this transition in our business over the last 5 years. A self-aware rep has recognized and adapted to this change and has evolved their approach. They seek out guidance and coaching when presented with any challenge but don’t rely on training to be provided by the organization before they take action. While many in the promotional products business feel that growing their salesforce (with a book of business the rep brings with them of course) is their best way to success, I would take an eager self-aware salesperson any day of the week. Bonus link: Why hasn’t “The Offer” caught on in business? An incentive is by definition something that motivates or encourages one to do something. In today’s extremely competitive marketplace, making sales can be a challenge. People are inundated with new products and services, and it is increasingly difficult to stand out. So what is one way to distinguish yourself from the competition and lead sales? Incentives! Did you know that knowledgeable and courteous employees account for approximately 80% of the reasons that consumers feel satisfied and will come back for more? Fewer than one in four American workers is working at full potential, nearly half surveyed have said that they do only what is directly asked of them, and up to 75% admit that they could be more effective in their jobs. 70% of customers that have had a bad experience with a vendor will abandon them and move on to someone else. A 5% increase in customer retention can increase lifetime profits from a customer by 75%. Remember, we’ve talked about this before, it’s about building relationships. So how can you use incentives successfully in your business? Remember, everyone likes to feel appreciated, so why not set the precedent and use incentives to inspire others to greatness! Let’s face it, we are all brand experts these days. We have been groomed to recognize and associate with different brands. One marketing guru uses the word pre-eminence when speaking about brand identity, meaning it moves people to action, and their lives are better because you are in it. If you’ve done your job, then people can relate to and identify with you, and your product. There is an emotional connection tied to it. It’s about being able to articulate, or put into words what you stand for and why it’s better than say, your competition. Back in the 1990’s, Harley Davidson began considering ways to expand it’s empire, so the company decided to get into merchandising. They started selling patches, mugs, jackets, and other biker related paraphernalia. It proved to be a good move for the company. So much so, that an over enthusiastic marketing manager decided they should try and expand their market even further, into perfume sales. That decision backfired in a big way. They alienated their core audience, bike enthusiasts, (I don’t know about you, but I don’t know many bikers that wear perfume? ), even worse, they failed to capture the consumers who like perfume, but don’t ride bikes. What does this tell us? Don’t get greedy! Be loyal to your core audience and stick to the brand values that made you successful in the first place. In a world where people have so many options, and often times the services that we offer aren’t necessarily needs, but wants, we have to set ourselves apart, by clearly identifying what we are all about. As an example, we here at Benchmark Displays design custom displays for POP retail, as well as merchandisers, awards and promotional pieces. We are also aware that there are many companies that offer similar services to our own. Therefore, our emphasis is on being customer centric and building relationships. A first time client may call because they have a pending project and they need a quote. They probably have specs for the project, a desired quantity, and most often than not, a deadline to meet. Beyond that, they rely on us, to not only design an engaging, attractive display, but do so in a way that keeps costs minimal, and is delivered on time. If we consistently provide a quality, unique product, as expected, then we, as a company, and as a brand will thrive. When all is said and done, your brand, your identity, takes time to build. It needs to say something about who you are as a company, connect with your target market, motivate people in some way, and always create a sense of loyalty.